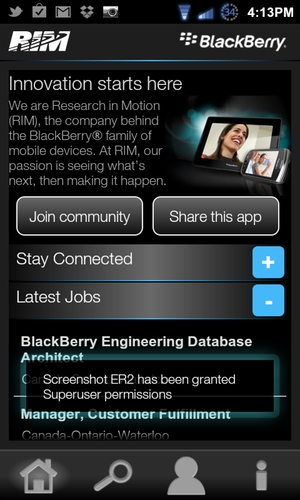 RIM launches Job In Motion App | BlackBerry Blast! RIM has launched their own jobs app for people looking to work at Research in Motion. The app is called Jobs In Motion, and it was released in the BlackBerry App World and Android Market. RIM didn't build the app, but commissioned UK based job site All The Top Bananas to build it for them. RIM is obviously looking for BB and Android developers which is probably why the app showed up in both markets.